(from Billboard Magazine, October 11, 2013)Coming back from a four year album hiatus, Pearl Jam was confronted by unwelcome guests at their Wrigley Field concert: dark skies and rain clouds. Three hours of rain put the city of Chicago past its 11 p.m. curfew, but that didn’t stop the band. Collaborating with city officials, they were able to extend the curfew and put on a 12-2 a.m. show. Playing songs from their upcoming album “Lightning Bolt,” the crowd became its own bolt of lightning. “Luckily our fans are receptive to new music. They don’t just want to hear the old hits,” said guitarist Mike McCready. Although the band hasn’t released an album in almost four years and the “Lightning Bolt” is set to release mid-October, the band has been busy. 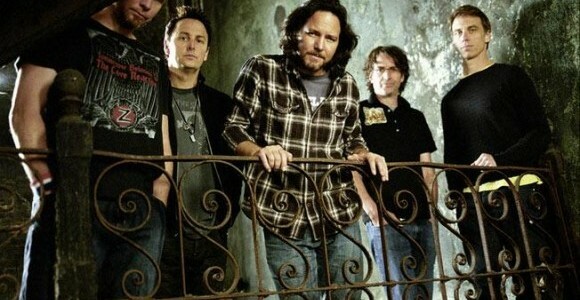 They recently released “Pearl Jam Twenty,” a history of the band’s twenty year journey; there have been side projects by lead singer Eddie Vedder, and Pearl Jam has been touring. As the band is growing older, their outlook on life and the music they make is changing. “We’re all at an age now where there’s a lot of reflection going on . . . The people that are our heroes–you look at the Whos and the Neil Youngs and the Bruce Springsteens–those guys are 20, 30 years down the road farther.” The band’s purpose behind making music has become more than playing Rock and Roll. Their music is becoming a story that shows how they develop and change as they all grow older.